Welcome to a new week everyone! 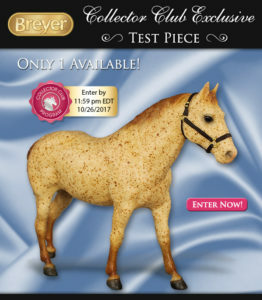 Breyer once again holding a Test Color lottery for current Collector’s Club Members. This one is the old Quarter Horse Gelding molding in an equally old style red roan! 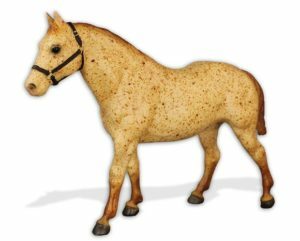 He is direct from the Breyer Archives and will include a COA. Breyer nicknamed this piece Red. Current Collector’s Club members may enter once a day until October 27th for a chance to win the right to purchase this horse. The Test Color Quarter Horse Gelding’s purchase price is $850 which includes shipping and handling. I find it nice that Breyer includes the cost of shipping on their Test Color lotteries. 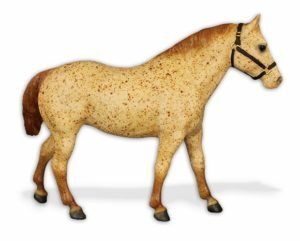 If you are logged into your Breyer Collector’s Club account, you can see the the Red Roan Quarter Horse Gelding directly at this link. Red, as we’ve nicknamed him, is a test color Quarter Horse Gelding. He sports a vintage splatter red roan coat reminiscent of 1970’s Breyer roans, with a pink muzzle and grey hooves. His halter is hand painted black with gold hardware. Red has been gracing our archive for nearly ten years and he’s ready for a change of pace! He is mostly free from flaws. He has a small rub that is hard to see but that can be felt on the point of the right hip. He’s also got a couple of minor hoof edge rubs. Otherwise he’s in great shape and excited about discovering a new home! Red is priced at $850 and comes with a certificate of authenticity. Only 1 piece is available for purchase. 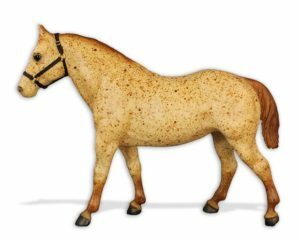 Which model is your favorite Breyer Collector’s Club Test Color offering?